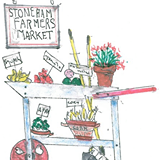 The Stoneham Farmers Market made its successful debut in 2015 and is back for its fourth season. Browse and purchase fresh and delicious farm stand produce, confections, flowers, and so much more. Keep tuned for updates throughout the summer and fall growing seasons.